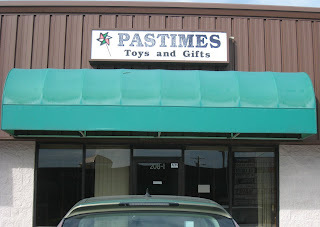 Not far from Crabby Mike's (see today's previous entry) is a gift shop called Pastimes. However, the establishment is no longer there, and the store is completely empty. It's a rather depressing sight, so I thought I'd take a picture. Given its current status, perhaps they should just change the sign to "Past Times." They didn't want to pay for that extra T or the space. It makes me do a double-take. I clicked funny because of your joke, not because I think it's funny that they went out of business. That part is very sad.